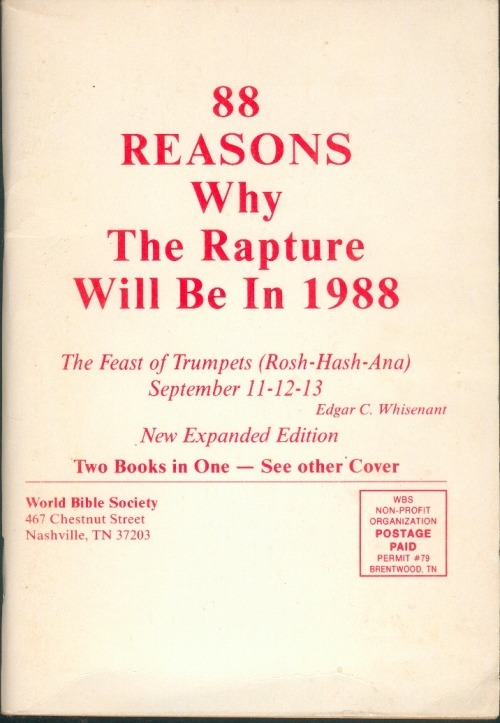 Doomsdays of Yesteryear: "88 Reasons Why the Rapture Will Be in 1988"
In honor of the approaching Mayan Calendar Doomsday in 2012, I am presenting an occasional series of "Doomsdays of Yesteryear," to show how often the world has ended in the past, entirely without effect. 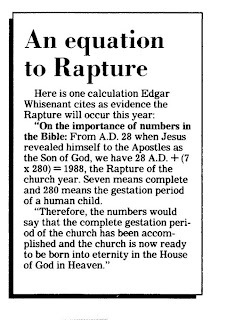 The former NASA engineer and self-taught Biblical scholar Edgar C. Whisenant attracted many followers in the Evangelical Christian community with his confident prediction that the Rapture would occur in 1988, probably to coincide with Rosh Hashana. Over four million copies were sold, and many others distributed for free. He confidently stated, "Only if the Bible is in error am I wrong," and we know that isn't possible. He also predicted that a nuclear war would break out between the US and the USSR on October 4, and the Final Judgment occurring in November, 1995. 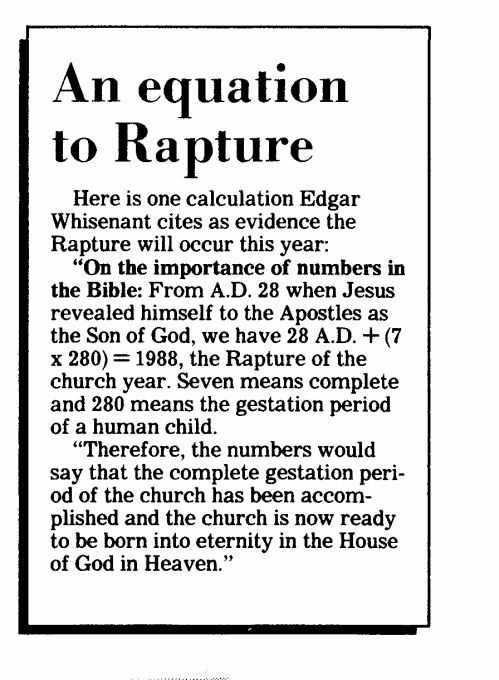 When the world failed to end in 1988, he issued more rapture predictions for 1989, 1993, and 1994, but these did not attract as much attention. According to religious broadcaster Harold Camping, The Rapture is set to begin in less than three months, on May 21, 2011. But I would not forego any sinning on that account. Camping's earlier prediction of The Rapture in September, 1994 was likewise a bust. With so many people getting worked up over Doomsday predictions for 2012, I think it's instructive to look at some previous End-of-The-World hysterias. That should help put such claims into perspective. In 1974, the book The Jupiter Effect by John Gribbin, PhD and Stephen Plagemann was published. It became a huge best-seller. 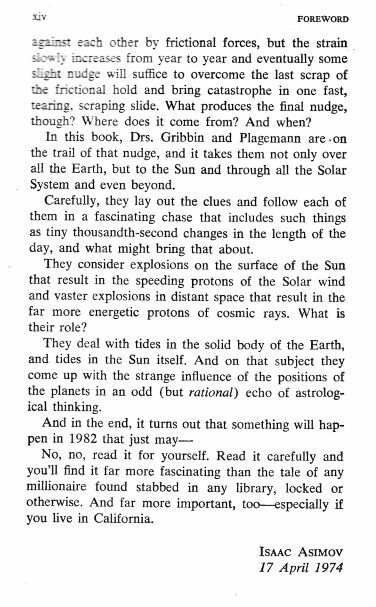 Its argument was simple: in March of 1982 there will be an "alignment" when seven planets (six if we correctly ignore Pluto) will be lined up on the same side of the Sun. And "lined up" is used in the rough sense: they're within an arc of 95 degrees, or in other words, all within one quadrant, more or less. Somehow this was going to affect the Sun, which would then affect the Earth by the solar wind, and trigger a catastrophic earthquake along the San Andreas Fault near Los Angeles. I don't know why the solar wind wanted to single out Los Angeles and not Tokyo or Lisbon, but it clearly had sinful California in its sights, where the book sales to easily-frightened flakes, fruits, and nuts could be maximized. There were other catastrophes that would occur as well. Probably about as many people were then frightened about 1982 as are now frightened about 2012. And of course, 1982 came and went without any of the predicted catastrophes occurring. In February of 1982, these same two authors published The Jupiter Effect Reconsidered. They didn't even wait for March to come and go before they started writing their apologia. They claimed that, even though the alignment didn't cause any major earthquakes in 1982, it was responsible for triggering the giant eruption of Mt. St. Helens in 1980 (two years before the "alignment" had occurred). "Psychics" do this all the time, re-interpreting their failed predictions as successes. If a "psychic" predicts A, which doesn't occur, but B does, the prediction will be re-interpreted to have meant B. Surprisingly, neither Gribbin nor Plagemann has ever been tarred-and-feathered for their journalistic malfeasance. And what was Isaac Asimov thinking when he agreed to write the Foreward to this book, and sound almost like he agrees with them? Probably the same thing as the authors: big Dollar Signs. Two postings ago I wrote about Peter Gersten's planned "Leap of Faith" from Bell's Rock in Sedona, Arizona at the precise moment of the December solstice in 2012. He thinks that some "trans-dimensional event" will occur, sucking him into it, where he will probably meet the late members of the Heavens Gate cult, still wearing their sneakers, as well as Jimmy Hoffa and Judge Crater. I said there was no unusual "alignment" occurring at that time. Gersten disagreed, and pointed me to some information about a supposed alignment of the Sun with the Galactic Equator, at the moment of the solstice. I then wrote another posting, pointing out that this supposed alignment actually took place in 1998, and in any case is "signifying nothing." 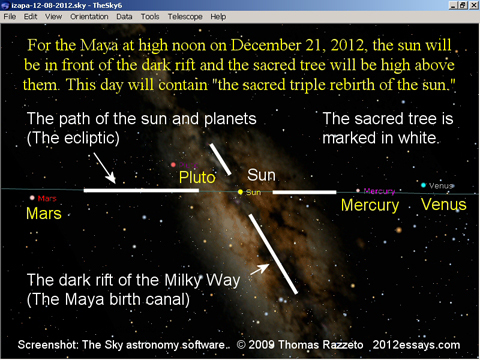 Gersten disagreed again, and pointed me to the Really Good stuff: Thomas Razetto's claims about the supposed alignment of the solstice point with the Great Rift of the Milky Way, also (allegedly) known as the Maya Birth Canal. This, says Razetto, constitutes "The Sacred Triple Rebirth of the Sun." The "Great Rift" or "Dark Rift" of the Milky Way is simply big old cloud of dust and gas along the Galactic plane that obscures the stars behind it. Many galaxies have this, not just ours. 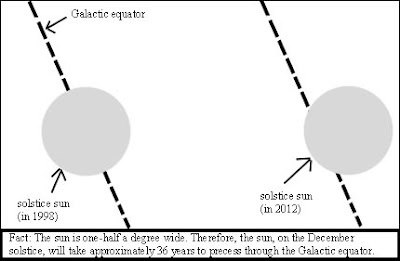 Since we have seen in the last posting that the Sun is not aligned with the Galactic Equator at the time of the 2012 winter solstice (although it would make no difference even if it were), if you look around hard enough, you'll find something that the Sun is aligned with. In this case, it's the Milky Way's Great Rift. Throw a few planets into the mix, and you can fashion up a "Sacred Tree." Razetto apparently doesn't care that Pluto has now been (quite properly) downgraded to the rank of the minor planets. Is he going to include Ceres, Vesta, Sedna, and Chiron in his "alignment" as well? I think any rational person can see that this "Sacred Triple Rebirth" of the Sun and the "Sacred Tree" is a load of horse manure, especially when it comes from a website calling itself "infinitely mystical." I could make up a similar "cosmic alignment" story for practically any equinox or solstice, throw in a few planets, and invent some high-sounding reason why it signals the beginning of a Cosmic New Age. Most people don't realize that the inner planets Mercury and Venus spend a lot of time (from the earth's perspective) hanging out in the vicinity of the Sun, and since Mars is on the opposite side of the Sun from us at that time, it appears to move more slowly than at other times, and thus, yes, also seems to loiter for a long time in the vicinity of the Sun. To find any significance whatsoever to having Mercury, Venus, and Mars in the vicinity of the Sun at some random time requires one to be ignorant of planetary orbits. But forget all these facts: this is astrology, plain and simple, and astrology is ancient superstition, nothing more. It doesn't matter where this planet is, or that planet. It's all humbug. Since Gersten finds Razetto's claims to be convincing, so convincing that he is willing to risk almost certain death because of it, there is nothing more for the rational person to say. When Faith clashes with Reason, Faith wins out nearly every time. I can only wish him well, and hope that he acquires at least a little bit of common sense on this subject in the next 675 days (the "countdown" is on his website) and not go through with his mad plan. And I've said enough about the supposed "Cosmic Alignments" of 2012. This posting and the one before it lay out what the case is supposed to be for the 2012 solstice to be something cosmically special. As you can see, there is absolutely nothing unusual or special occurring at that time. It's just the same old "when the Moon is in the Seventh House, and Jupiter aligns with Mars." I suggest that anyone who has gotten even a little worried by all the Doomsday talk about 2012 read these postings carefully. If you realize that you've gotten all worked up over a "Sacred Tree" superimposed over the "Maya Birth Canal," you're going to feel rather silly about it. Or at least I would. We keep hearing from "New Age" folks and many others about an major "cosmic alignment" that is supposed to occur on the date of the Winter Solstice in 2012, on December 21. In the previous post, I described how UFO lawyer and New Age guy Peter Gersten plans to take a "leap of faith" off huge Bell Rock at precisely 4:11 AM (Mountain Time), the time of the solstice, which he expects will open up a "cosmic portal" and take him to some other plane of existence, hopefully a better one than this. I said "from an astronomical standpoint, there is nothing special or even a little bit unusual going on in December of 2012. Nada." Gersten posted a comment disagreeing with that statement, containing a link to one of his web pages, which in turn has a link to "What is the Galactic Alignment" by John Major Jenkins. And he has a point. There is an alignment - however, it has no significance, and it actually occurred in 1998. To understand what this is about, you will need to visualize the celestial equator, the ecliptic, and the plane of our Milky Way galaxy. It's hard to visualize this, because hardly anyone studies spherical geometry any more (navigators of old knew it solidly). Let's use an earth globe to represent the "celestial sphere," which of course isn't a real object, but it looks like a sphere, and it can be modeled as one. First visualize the equator. The equator makes a "great circle" around the earth, meaning that its center is the center of the sphere. (Lines of longitude are Great Circles, but parallels of latitude are not.) Then visualize the ecliptic, which is inclined to the equator at an angle of 23.5 degrees. This is the plane of the earth's orbit projected into the sky, and it also a Great Circle. Imagine it stretching on the globe from the Tropic of Cancer in Morocco to the Tropic of Capricorn in Australia. But there is yet a third Great Circle we need to be concerned with: the plane of the Milky Way, which is inclined about 60 degrees to the ecliptic. Remember that all Great Circles intersect at two points, so it's not a question of if they cross, but where. 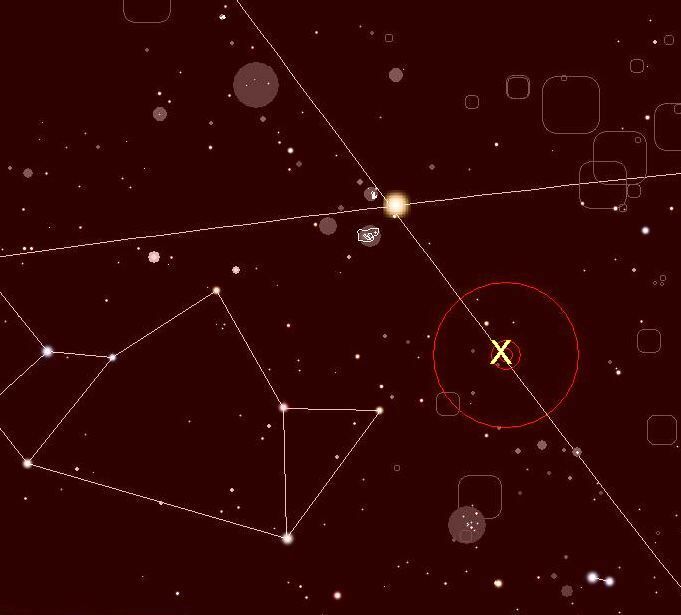 And the Grand Cosmic Alignment of 2012 is illustrated by the above illustration I made using Skychart (Cartes du Ciel, a free Open Source program that I highly recommend). 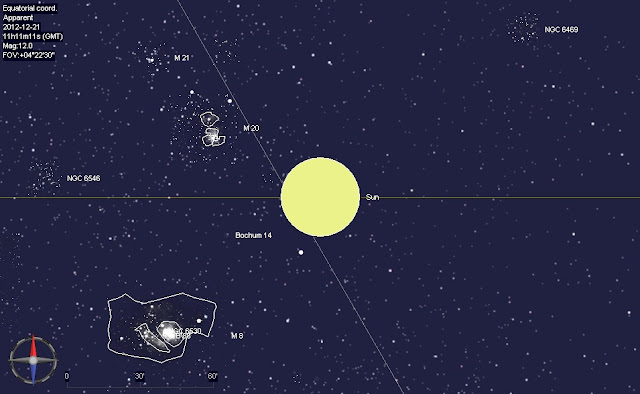 It shows the Sun at the time of the December Solstice on Dec. 21, 2012 at 11:11:11 UT. The ecliptic is the line that's level, on which the Sun appears to be moving from right to left. The inclined line shows the plane of the Milky Way. There is your alignment. "But wait," you say, "they're not really aligned." True enough. 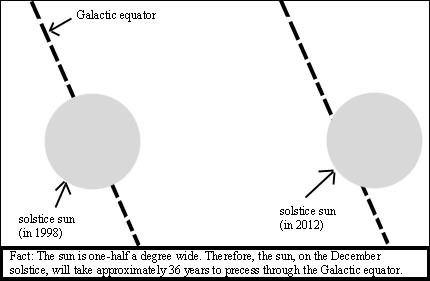 The actual "alignment," such as it is, occurred in 1998, when the center of the sun aligned as closely as possible with the plane of the galaxy at the time of the solstice. In fact, since the Sun has an apparent diameter of a half-degree, as seen from Earth, "alignments" such as these began in 1980, and will continue until 2016. So there you have your "Grand Alignment," which actually occurred in 1998 and was meaningless even then. Why this supposedly has any connection with the 2012 solstice is anyone's guess. As for the talk about the Sun "aligning" with the center of the galaxy, well, it never happens. The galaxy's center does not lie on the ecliptic, so the sun never reaches it, although each December Solstice the Sun passes only about six and a half degrees from it. Wow! In fact, as you can see the Sun actually passes closer to the galaxy's center several days before the solstice, as it appears to move eastward along the ecliptic. But is that dramatic? Naah? So if I were Peter Gersten, I'd wait for a much better "alignment" than this before leaping off a cliff. 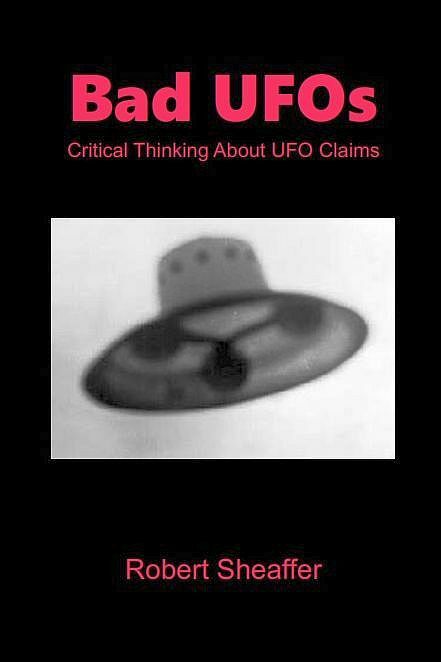 Lawyer Peter Gersten has been a well-known figure in UFOlogy at least since the 1970s. He filed suit against the CIA in U.S. District Court in 1977 for release of documents concerning UFOs. This resulted in over 900 pages of documents being released, although there was little in them that wasn't already known. There were 57 pages that were held back due to "national security" concerns. UFOlogists made a big stink about this, claiming it's proof of a government cover-up. However, the files were held back because they might allow other nations to gain information on U.S. capabilities in electronic and signals intelligence. For example, there was one document where the CIA listened in on a Cuban pilot discussing a UFO sighting. The problem wasn't the UFO sighting, it was that we didn't want the Cubans to know we'd been able to hear their pilots' conversations. 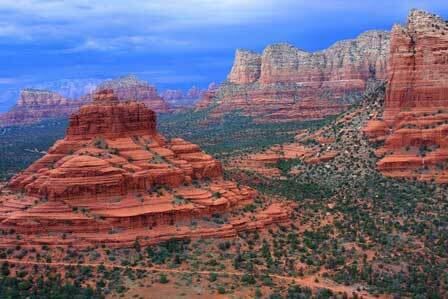 Now retired to Sedona, Arizona, a center of a supposed 'New Age energy vortex', Gersten says that he plans to take a "leap of faith" from Bell Rock, a well-known vortexy place in Sedona, at the moment of the solstice: 11:11 UT on Dec, 21, 2012. This will be 4:11 AM in Arizona, and according to a reference I checked (http://www.timeanddate.com/calendar/seasons.html target=BLANK ), is within 1 minute of the time of the actual solstice. When I first read about this, I could not believe that it was true. Perhaps somebody with a grudge against Gersten made this up? Yet in the YouTube video above, we see and hear Gersten telling, in his own words, about his plan to (hopefully) leap into the portal that he believes should be opening up. He explains that, even if he dies in this leap, it is probably good Karma to die at such at the time of such special cosmic energy. What Gersten and so many others do not seem to realize is that from an astronomical standpoint, there is nothing special or even a little bit unusual going on in December of 2012. Nada. There will be a Transit of Venus across the Sun on the afternoon of June 5, 2012 (the morning of June 6 in Asia and Australia), which is a really special and rare celestial alignment (the next one won't occur until 2117), but clearly that is not what the hoopla is about. No "alignments" are going to happen around the 2012 winter solstice that do not also happen every other December. Supposed "Bible Codes" and "ancient calendars" simply don't cut it. No matter how many times nonsense is repeated, it still remains nonsense. Echo chambers do not contribute to truth. I've briefly met Gersten a few times, and he is a pleasant fellow. I hope he is not serious about this, and finds reason to change his mind. If he's in good health at age 70, he can easily live at least another ten or twenty more years. I hope he doesn't give up the rest of his life because of babblings about "ancient calendars" and "trans-dimensional effects." [For updates on this story, see the posting The Apocalypse Made Easy, November 17, 2012. After the usual "travel time" of 2 or 3 days, the sensational UFO videos from Jerusalem, Israel have finally made their way to the Big Time (the mainstream media). The two videos (originally) appear to show a bright nocturnal UFO flying and hovering over the Dome of the Rock on Temple Mount, the point where, Moslems believe, the Prophet Mohammed took his "night journey" into the Heavens (al-Miraj), passing through the Seven Spheres to meet with Allah himself. For some time, I have been pointing out the lack of consistent UFO videos or photos taken by multiple independent witnesses, who had not been in contact before the incident. That is what we appear to have here, unless the case is a hoax (widely suspected, but not demonstrated). The first video was posted to YouTube on January 28 by a user called "eligael" ( http://www.youtube.com/watch?v=zQ-bNOy_CKQ ). It has a length of 1:45. It purports to show a UFO hovering over the Dome of the Rock in the far distance. It descends quickly to hover just above the dome, then disappears with a flash some 23 seconds later. Two men are heard discussing it, presumably in Hebrew. One man is seen in the foreground (barely), and appears to be filming it with a cell phone camera. According to a video posted to YouTube on Jan. 30 by HOAXKiller1 titled "HOAX - UFO Over Temple Mount in Jerusalem - Motion Tracked" (http://www.youtube.com/watch?v=cHOc35nmUDk ), claims that there is a "parallax problem" where two lines that ought to remain parallel despite small camera motions, don't. Unfortunately, the video is so dark that this is extremely difficult to see. A second video from this same perspective was posted by Eligael on Jan. 29. It has a length of 1:30. It appears to be consistent with the first. A third video posted to YouTube on Jan. 30 by 50nFit seems to show the same UFO from a much closer perspective ( http://www.youtube.com/watch?v=rY2FFEufsuY ). It has a length of 0:48, and features people commenting in English. One woman with a thick Southern accent says, "We've seen 'em in Mississippi like this, but never like that." According to "Mr. Mask" on the Above Top Secret thread, "The third video (though mistakenly called "second" in its title) was of the UFO from a totally different perspective and with what appeared to be many voices. One was a lady from Mississippi. The video was proven to be a moving computer effect added over a still picture easily found HERE . The clip is clearly a Hoax and a bad one at that. Truly the work of a desperate and loathsome huckster." "Eligael" posted yet a third video to YouTube on February 1, titled "Another night of ufo over Jerusalem - old city" ( http://www.youtube.com/watch?v=nUYQ8WlLJB8 ).This one has a length of 1:25. 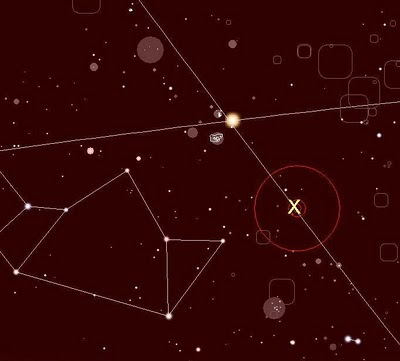 It appears to show a single point of light against a dark sky, dropping down, then flying off mostly horizontally to the right. Nothing is seen but the UFO. A "fourth" video, also in Hebrew, was posted to YouTube on Feb. 1 by Disclosur3. It has a length of 1:15. It shows a UFO hovering over the dome, looking brighter than in the other videos. ( http://www.youtube.com/watch?v=u23BiBHvZao&feature=related ). The UFO and Conspiracy Website Above Top Secret warns, "Due to the possible connection of these clips with a known Hoaxer who is banned from this site, this thread may be 404ed/erased at anytime or thrown in the hoax forum if it is proven that this hoaxer is behind this event" (http://www.abovetopsecret.com/forum/thread658652/pg1) . Whoever is responsible for this hoax, it clearly shows that at least a few people are willing to put far more effort into making a UFO hoax than ever before. "Classic" UFO photo hoaxers such as Mr. & Mrs. Trent, the Lucci brothers, and Rex Heflin, probably invested no more than about an hour or two making their now-famous creations. If "Eligael" is indeed the mastermind behind these clever videos, it is obvious that he has been willing to spend hours or even days creating his masterpiece.